Creek Vean, Cornwall, acrylic on board, 50x50 cm £sold. HMS Belfast and Tower Bridge, morning sun, acrylic on canvas, 45x100 cm, £sold. Looking down, Portreath harbour, acrylic on board , 30x45 cm, £ 795. Over Tresco, Isles of Scilly, acrylic on board ,28x60 cm £sold. Path through the meadow, Cornwall, acrylic on board, 47x40 cm, £sold. Pulteney Bridge and weir, Bath, acrylic on board, 40x59 cm £sold. River reeds and farm buildings, Cornwall, acrylic on board, 61x62 cm, £sold. 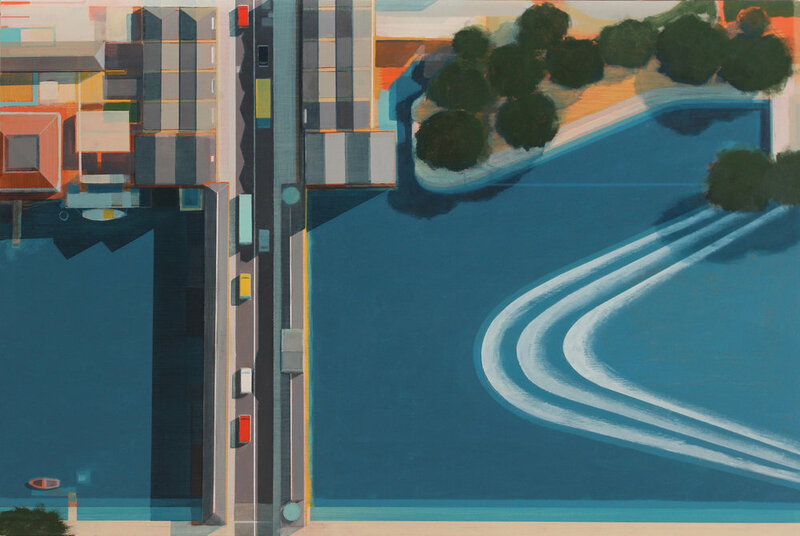 The River Avon at Pulteney Bridge, acrylic on board, 45x100 cm, £sold. Fishermans Wharf with rusty ship, acrylic on board, 45x45 cm, £sold.